Do you suffer from depression, anxiety, brain fog, headaches, or insomnia? How about Alzheimer’s, Parkinson’s, dementia, Multiple sclerosis, ALS, seizures, ME/CFS, or Autism? 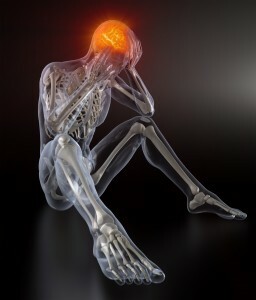 All of these neurological conditions have a common cause – chronic inflammation of the brain. Now answer this question – Have you ever taken antibiotics? If so, then the likelihood that you’ll experience one of these conditions, or others like them, is much greater. A round of antibiotics will destroy all the bacteria in your body within 5 to 7 days, causing a massive release of bacterial toxins into the circulatory system that prime your brain for a lifetime of chronic neuro-inflammation. This condition, Blood-Brain Barrier Hyperpermeability Syndrome, or “Leaky Brain”, can cause varying degrees of inflammation that can lead to the “diseases” and conditions listed above, as well as many others. Outnumbering human cells by a factor of 10 to 1, there are over 100 trillion bacterial cells in the body. Although these bacteria are a normal part of the human body and considered to be indispensable to health, they contain within themselves substances that the human body is highly allergic to. As long as a balanced intestinal ecosystem and flora is in place, they help us to grow, repair, and survive in many ways. Upsetting that balance can turn these benefactors of health into promoters of disease and death. One of the most pro-allergenic and pro-inflammatory substances found in bacteria are Lipopolysaccharides (LPS). LPS are a combination of fat (lipo-) and sugars (-saccharides) found in the cell wall of certain bacteria, known as Gram-negative bacteria. Some of the more well-known examples of Gram-negative bacteria are E. coli, K. pneumonia, N. gonorrhorea, and others that cause cholera, syphyllis, Lyme, typhoid fever, and the plague. While the normal varieties found in the human body don’t have the same notorious pedigree as those I’ve just mentioned, they do contain the same cell wall membrane structure and lipopolysaccharides. LPS are highly researched and studied for their ability to rapidly create inflammation in the body. This comes in very handy when researchers whish to study the mechanisms and impact of inflammation on human tissues and function. When LPS reach the blood stream in high numbers, they have the ability to cause sepsis and often death. At sub-lethal levels, they have the ability to create lifelong patterns of inflammation, such as those seen with neuro-inflammation and neurological diseases. The body’s response to the presence of LPS leads to the creation of strong inflammatory cascades by stimulating pro-inflammatory proteins in the body called cytokines and chemokines. Some of the well-studied increases due to LPS are IL-6, COX2, NO, IL-12, IL-13, IL-10, IL-9, G-CSF, GM-CSF, CCL-3, CCL-4, NOX and NF-κB, IL-1, TNF-α, PGE-2, C-Reactive protein, and others.LPS also causes long-term activatation of the NLRP3 Inflammasome, which has been connected to Diabetes, Multiple Sclerosis, Alzheimer’s, Parkinson’s, Crohn’s Disease, Irritable Bowel Disorder, multiple cancers, and on, and on, and on. With regard to the brain, results from studies vary as to whether or not LPS crosses the Blood-Brain Barrier (BBB), or acts on cells outside the BBB, leading to increased levels of swelling and inflammation in the brain. The BBB helps to shield the brain from toxins that may be present in the body, but it has a potential Achilles Heel at the circumventricular organs, where the barrier does not exist. Based on the research, it is most likely that there are several pathways by which LPS affects brain tissues. Regardless of the pathway involved, once the inflammatory cascade has begun, the brain becomes “primed” for a life of chronic inflammation. Subsequent exposure to LPS, even at minimal levels can set off inflammatory cascades within the brain. This priming is not however limited to LPS alone. Exposure to environmental toxins, diabetes, obesity, depression, and many other factors can increase inflammation in the body and cause increased levels of inflammation in the brain, once it has been primed. The body is well-equipped to handle the normal daily death of a few hundred thousand Gram-negative bacteria and the subsequent release of their LPS into the tissues and bloodstream. The liver and white blood cells, such as macrophages and monocytes, are able to round up and reduce the ongoing presence of LPS as a normal part of bacterial life and death in the body. Excessive loads of LPS are another story, as flooding the body with LPS exceeds the body’s capabilities. Many factors can contribute to increased levels of LPS being present in the body. Two of the most well-known ways to cause a massive release of LPS into the body are antibiotics and chemotherapy. While most people have been exposed to antibiotics, very few have had to endure chemotherapy. That will change in the future as antibiotic resistance continues to escalate, and chemotherapeutic agents will become more widely used as a replacement. Different antibiotics affect the release of different quantities of LPS from Gram-negative bacteria, and some bacteria have higher levels of LPS than others. This then leads us to how much LPS would be required to cause a priming of the brain for a life of inflammation and accelerated degeneration. LPS are also referred to as endotoxins and they are measured in Endotoxin Units. One EU would be representative of the amount of LPS present in 100,000 cells of the Gram-negative bacteria, E. coli. As little as 5 EU/kg of body weight has been linked to causing symptoms of inflammation, such as fever, low blood pressure, increased heart rate, etc. A person weighing 170lb/77kg would require about 38.5 million bacterial cells to die to produce symptoms. With 100 trillion bacterial cells present in the human body, that’s 2.6 million times more than what is necessary to produce symptoms. Of course some of these 100 trillion cells are Gram-positive bacteria that don’t contain LPS in their cell wall membrane, but they do contain other substances like Lipoteichoic acid (LTA) and Peptidoglycans (PGN) that initiate their own set of inflammatory patterns and neurodegeneration within the brain. Antibiotics are also known to suppress the immune system’s white blood cells, which decreases the body’s ability to handle even normal loads of bacterial toxins. Liver injury is another possible side-effect of antibiotics and this would greatly reduce the liver’s ability to clear LPS and other toxins from the blood. The inflammatory cascade from taking antibiotics has a major impact on the liver as LPS and other substances are taken up from the intestines into the Portal vein and directly into the liver. The use of antibiotics creates a mathematical impossibility of side effects for the body to handle. They establish a chronic degenerative process within the brain that can lead to serious diseases and conditions, months or years later, seemingly unrelated to the original insult and cause. Medicine continues to focus on their idea of of recognizing only the perceived benefits of antibiotics, while ignoring the science of “side effects” associated with their use. The one-to-one association of antibiotic use and subsequent fungal candida overgrowth is another area of concern. Fungal candida drives inflammation in the body and can contribute to a pattern of ongoing inflammation that accelerates brain degeneration and imbalance. Fungal candida activates some of the same pro-inflammatory cytokines as LPS, such as NLRP3, IL1, IL-6, IL-22, etc. Antibiotics create immune system dysregulation by altering the composition of bacterial flora and therefore their ability to regulate and balance immune function. Immune system dysregulation is another source of ongoing inflammation that can contribute to neuro-inflammation and neurodegeneration. The medical profession is ill-prepared to address the complexities of antibiotic use and by default does nothing. According to the World Health Organization, antibiotic-resistance has become the 3rd leading threat to human health on the planet. Government agencies call for the reduction of antibiotic use and implementation of new prescribing practices. In 2003, the FDA mandated that all infections be cultured and submitted to susceptibility testing prior to the prescribing any antibiotic to any patient. The medical field has responded with nodding approval and non-action, choosing instead to continue on as they have been doing. Deaths due to antibiotic-resistant bugs continues to climb. The experts state that over 50% of antibiotic prescriptions are unnecessary and in children that rate can climb as high as 90%. The public continues to be placed at risk by a profession unwilling to adopt evidence-based practices and stay abreast of the latest that science has to offer. Each new study on the detrimental effects of endotoxin-induced neuroinflammation and neurodegeneration further deepens the gap between science and medicine. More and more, people are moving away from the old paradigm of trusting their medical doctor to know what’s best for them. Many patients have a deeper understanding of their conditions and diseases than the doctors they visit. Instead of blindly trusting a blind profession, they have chosen to educate themselves and play a greater role in the their own healthcare and that of their families. While the medical field mocks such self-education, the holistic fields embrace an educated partner and seek to assist them in furthering their knowledge and understanding. In the end, it will always be upon each of us as to whether or not we take control of our own lives, or by default, hand that care over to someone who feels as though they don’t have to answer to anyone. Leaky Brain, or Blood-Brain Barrier Hyperpermeability is a reality of antibiotic use. As with fungal candida, restoration of healthy bacterial flora, immune system balance, ongoing detoxification of the body, and healthy eating practices are necessities that everyone who has had antibiotic exposure will need to adopt in order to reverse the detrimental effects of antibiotics. Those who wait too long may find it difficult to build bridges where a foundation no longer exists. Nothing is impossible, however, and the body has amazing abilities of recovery, but how long will you wait? We live in a world where the very air we breathe and the foods that we eat can often be sources of toxic exposure. There are well over 140,000 chemicals and heavy metals that are added to the environment each year. Medications are a part of over 70% of the world’s waterways and their presence cannot be filtered out by current technologies. Industrial practices endanger the planet. Each nuclear accident increases the levels of background radiation up another notch and threatens food supply chains. It’s all a part of the planet today and most of it seems too far off to impact us in any way, a comforting thought without much substance. We can take control of our health and take an active role in regaining, restoring, and maintaining our health. It’s up to each of us to decide.